In this week’s column, I examine a host of iTunes questions. I look at a bug in iTunes 12, where deleting the genre tag creates a blank genre. I discuss an issue where a reader couldn’t import AAC files into iTunes. I explain how to combine a pre-ordered single with an album. And I show how to sort artists by their last name. Q: I’ve noticed a new behavior with editing the Genre tag in iTunes 12. Previously, when I wanted to remove a Genre tag and not reassign it (keep it blank), deleting the genre tag from the Info window worked just fine—there was no genre assigned. Now, when I delete the genre, the track has a blank genre. Is there any way to fix this? I contacted the reader and he explained that he likes to have some of his music with no assigned genre tag so that he can use smart playlists to find certain tracks that do have assigned genres. I followed the steps he’d taken and, indeed, the genres were not empty in tracks I changed. When deleting the Genre tag, iTunes replaced it with eight spaces, rather than nothing. I explain this more in an article on my website. iTunes 12 does not delete the Genre tag when you tell it to, and creates a blank genre. As near as I can tell, this is a bug. There are a couple of workarounds. If you edit each track individually, you can correctly delete the Genre tag. Or, you can delete it in the old Info window. To do that, hold down the Option key, right-click the track, and select Get Info for multiple tracks. The old Info window appears. Now delete the tag. Or, you can use an AppleScript that Doug Adams whipped up, which deletes the Genre tag correctly. Q: After spending 12 hours converting the MP3 files on my PC to the AAC format, I discovered that iTunes doesn’t accept AAC files converted by other software. It refused to add my files. How can I convert my existing MP3 files? iTunes does not refuse AAC files converted with other software. The problem here was that the user chose a different type of AAC file; one with the .aac extension. He sent me a file and I found that he had converted them to ADTS (Audio Data Transport Stream) files, which is a format used for streaming AAC audio files. The user went back and selected M4A as the format, and all worked well. Two things to note here. First, AAC files are not restricted to use as music files. In this case, a sort of hybrid format is used for streaming over Internet radio stations. Second, if you’re not aware of it, the .m4a extension may seem surprising, especially if you know that the format you want is AAC. Audio files have an alphabet soup of formats and file extensions, and it can be quite confusing sometimes. Q: I frequently buy singles that are available before complete albums are released on iTunes. When the album is released, the single I bought earlier is separate from the complete album. For instance, Maroon 5’s album V has 14 songs. I downloaded the single “Maps” before the full album was released. After I purchased the full album, the first song, “Maps,” was not downloaded, and, in iTunes, “Maps” is tagged as a different album called Maps-Single rather than under the album V, which now has only 13 songs. How can I change the single’s tagging so that it appears with the full album? It is common that, when you pre-order an album, you get to download a single. As you say, the two are tagged differently: one with the single’s name as the album, the other with the album name. I don’t understand why this is the case— if you’re pre-ordering the album, it should be tagged correctly. Even if you do buy only the single, why should the album tag be different? Here is a single, and its album, delivered by iTunes with different Album tags. In any case, here’s what you need to do. Put all the tracks—single and album—in a playlist. Select the single and then press Command-I. Note the track number of the single in the album; for example, in the screenshot above, and in the reader’s example, it’s the first track. Make sure to change the tag for the track number as well as the total number of tracks. So, in the example above, I change the single to Track 1 of 11. Then change the album tag of the single to match the album name. Click OK to save these changes. The tracks may not sort in the playlist, but they’ll be in the correct order. However, if you do want to have both the single and the album, check your Purchased page on the iTunes Store (look under Quick Links on the main page of any section of the store). On the Purchased page, click All at the top of the library, and then Songs. Find the artist in the left-hand column and you’ll see all the songs by that artist. This should list all the songs the album contains as well as the single. You can just download the missing song to fill out the album and keep the single in your library if you wish. Q: In iTunes 12 I’ve noticed that when I rename an artist, such as changing Selena Gomez to Gomez Selena, the last name doesn’t sort alphabetically. Gomez sorts as S and not G. Any ideas on how to fix this? Make sure to change the Sort Artist tag. Select one or more tracks, press Command-I, and then click Sorting. You’ll see the artist name and a field labeled Sort As. Make sure to either delete this latter field or enter the name as you want it to sort. 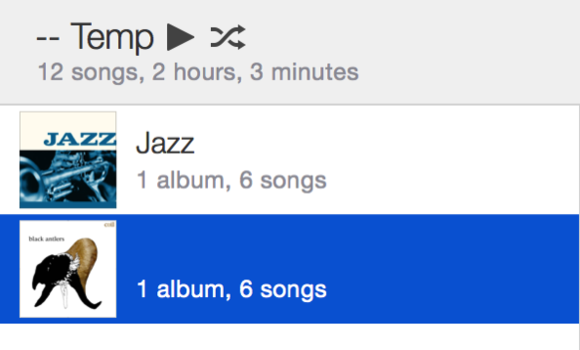 To have tracks sort by the artist’s last name, you need to tell iTunes to do this. 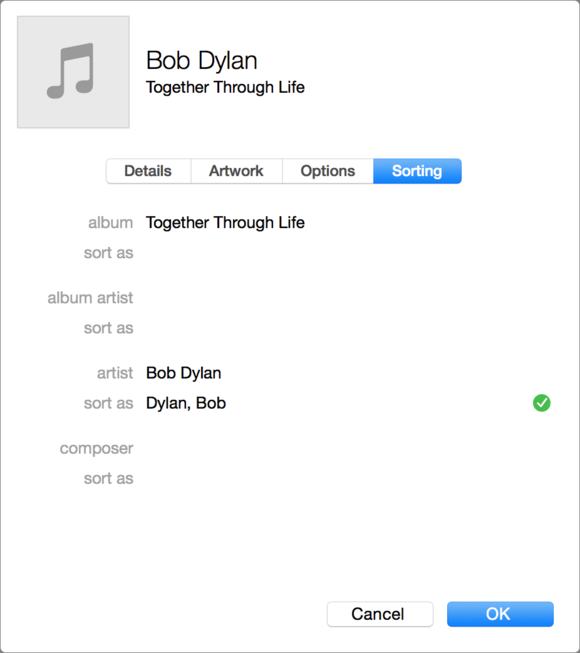 So, in this case, if I want the music to sort as Dylan, Bob, I enter that in the Sort As field.